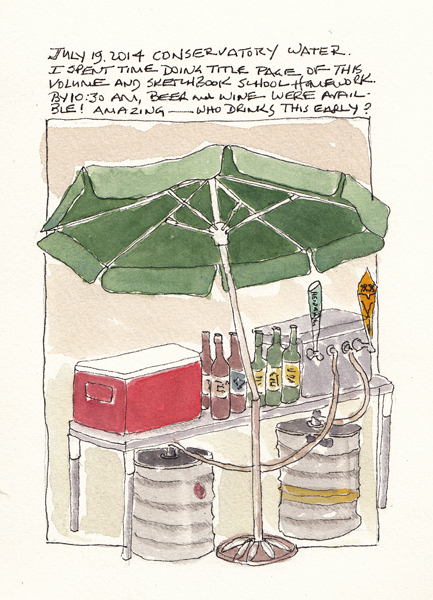 I spent one day this week sketching with the New York City Urban Sketchers Group. All of our time was spent in the West Village and I used an accordion watercolor book that I made last year for my paintings. Here is the open book showing the portion of the paper that I covered. 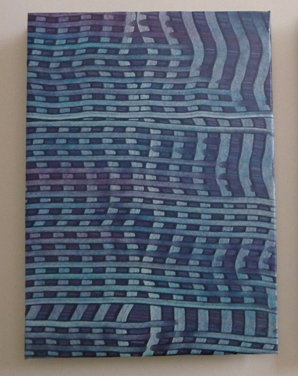 The front and back were covered with paste paper that I made in a 2013 workshop at Center for Book Arts. 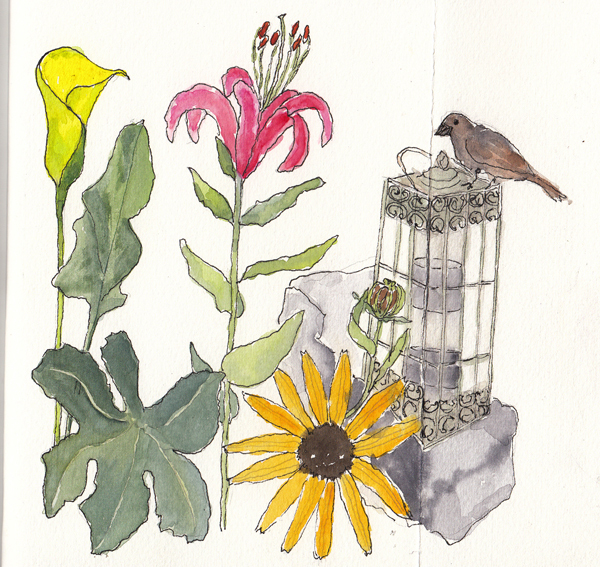 Flowers, a bird feeder, and a house sparrow in a garden of a St. Luke's Episcopal Church on Hudson St.
A landmarked house in a beautiful area near the Cherry Lane Theater. Table items at Pain Quotidien where 8 of us stopped for cold coffee and tea. This group was the new "weekday" portion of the NYC Urban Sketchers Group - and hopefully the group will be able to support both a Saturday and Weekday group to accommodate many different work schedules. 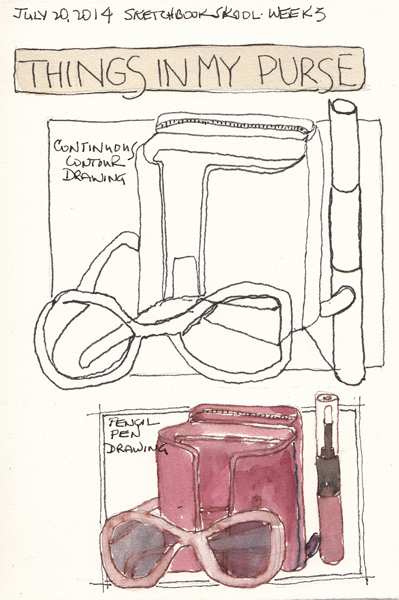 I will fill the rest of this accordion the next time I sketch with them. 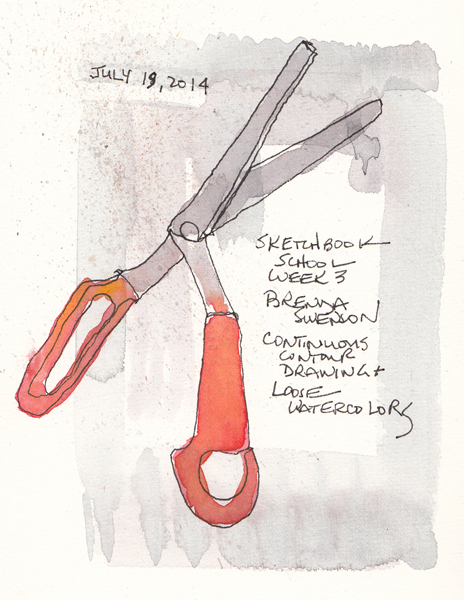 This is week 3 of Sketchbook Skool. 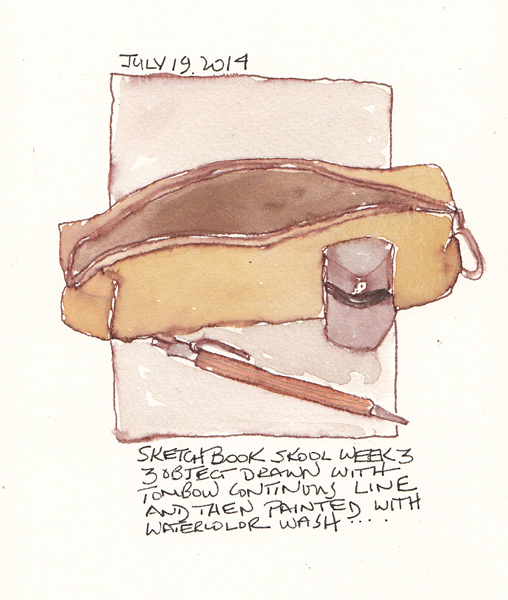 I loved seeing Brenda Swenson's sketchbooks and looked forward to our homework - 3 drawings using Continuous Line Contours and then a contour drawing of 3 objects with a watersoluble pen followed by painting with watercolors. 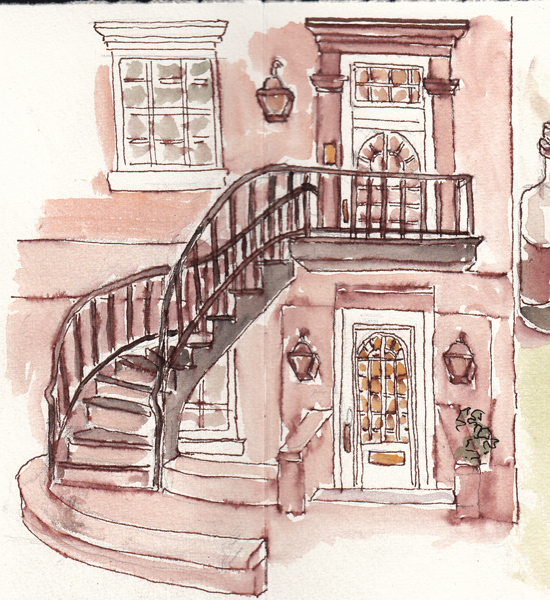 I loved how her Tombow marker, in sepia, just dissolved into her painting. We were supposed to draw one object, then two objects, and 3 objects. I'm not very good at following directions, so I drew the first one with a regular pen and the last two with Tombow markers because I couldn't wait to try it. 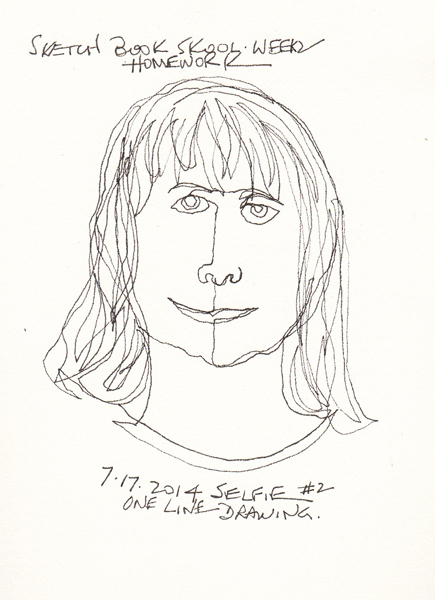 My assessment: I can't really do continuous line contour drawings as well as I draw normally. 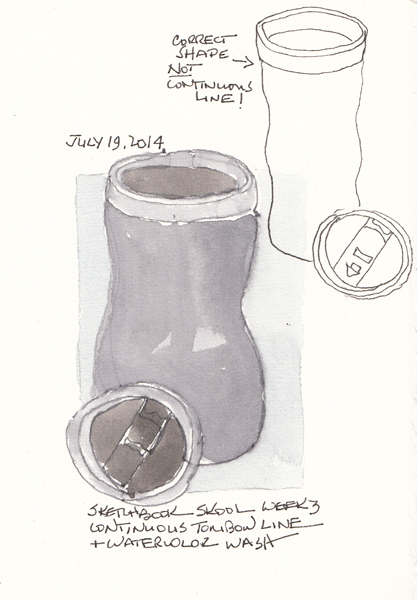 Figuring out how to maintain a continuous line was tedious - and in the second drawing you can see that I totally missed the real shape of the travel mug and did did a simple drawing in my usual style. 3 objects - drawn with a Burnt Sienna Tombow marker and then painted: This is the best of my continuous line drawings - and my double lines were washed away when I painted it. The next day I tried to do the homework again and you will quickly see that I draw more confidently and accurately in my usual style. 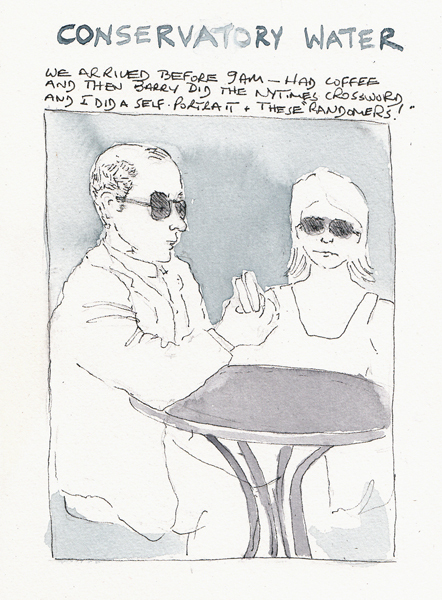 The smaller painted drawings were done out of frustration with the continuous line contours. I did a quick pencil sketch, added pen, and then painted it in the same amount of time that it took me to go slow and do the continuous line contour drawing. 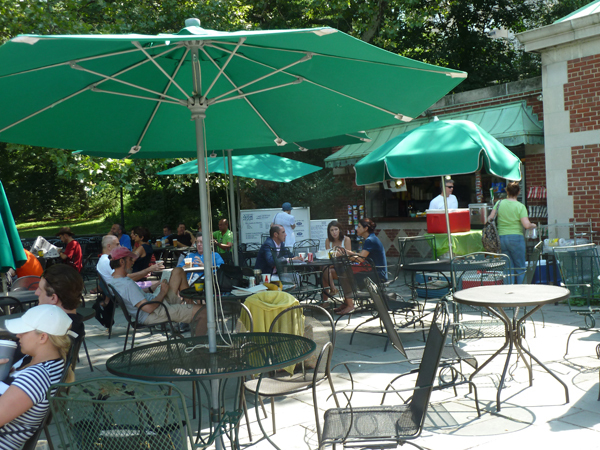 I did my homework in the Conservatory Water Café in Central Park, sitting on the patio with my husband while he did the NY Times crossword puzzles. 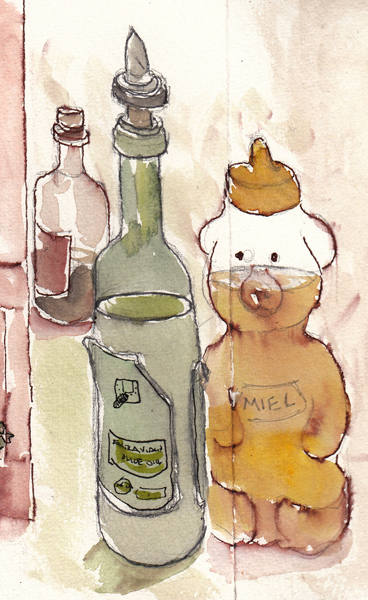 After the above two pages, I returned to my usual drawing and painting method and sketched the "bar" area of the Café. Who drinks beer and wine at 10AM?? 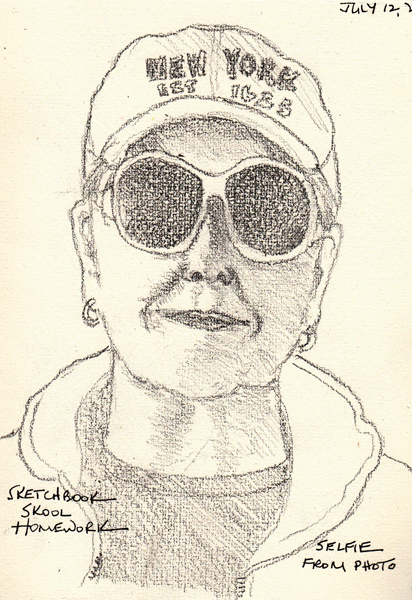 We finished our week with Koosje Koene in Sketchbook Skool and I did most, but not all of my homework. Today I'm posting another selfie from a mirror, and one from a photo. The first ones from a mirror and photo were in my last post. 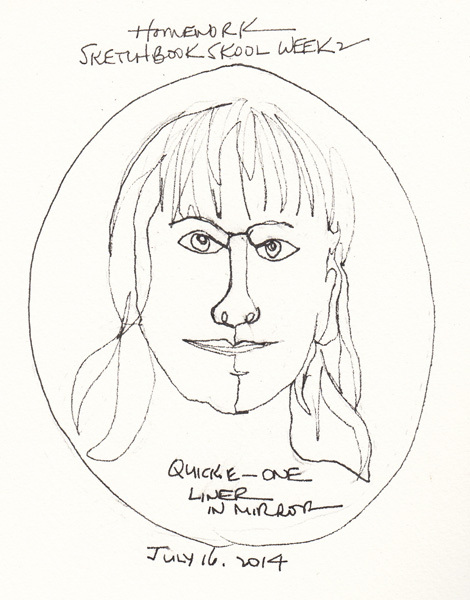 We also were supposed to do two continuous line contour drawings from a mirror and here are those 2. 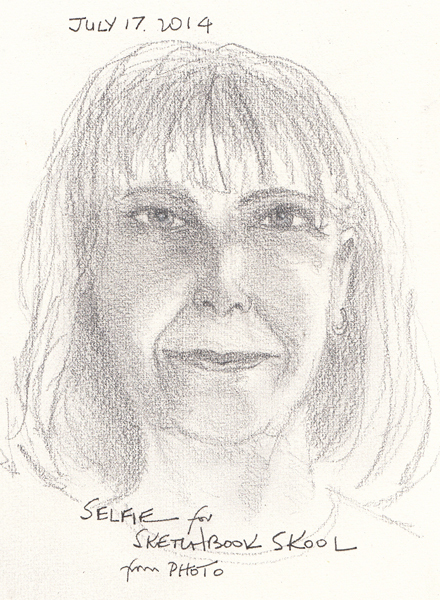 I didn't do #7 - which is a selfie from my imagination. Since all of these could have been from my imagination, since the resemblance is questionable, I declared myself done with my homework. 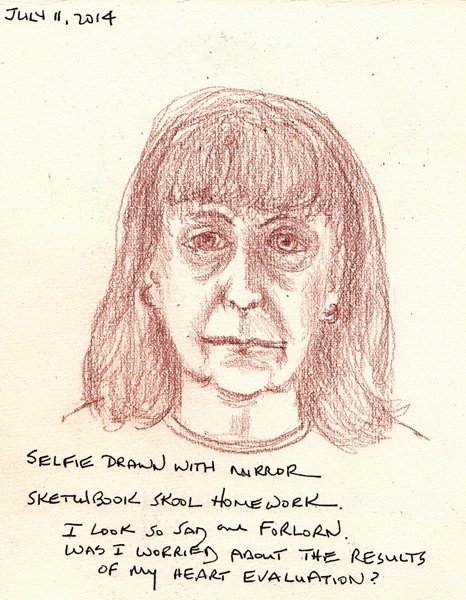 I think I will persist with these selfie drawings and paintings. 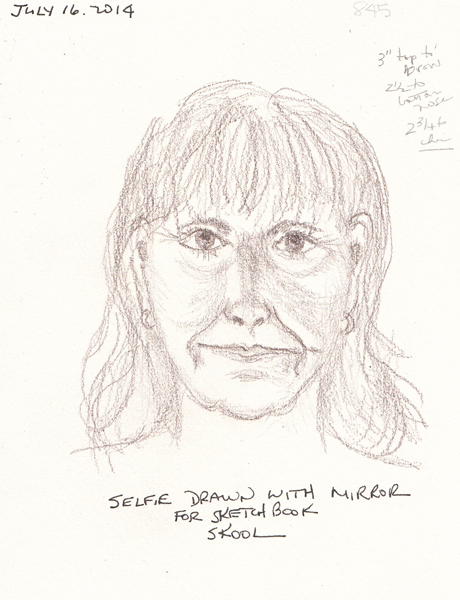 I was so inspired by see Koosje's Selfie sketchbook and seeing how creative she was - both with changes in facial expressions and props. And as she says, "you always have a model" - and just need to think of it as play! And I hope I will slowly get better at "seeing." 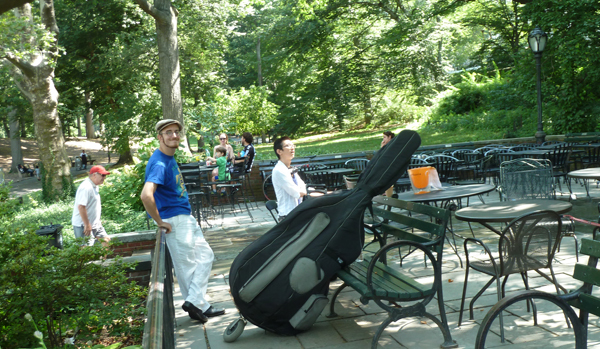 We went to the Conservatory Water again this weekend for morning coffee and I did 3 watercolor journal pages. 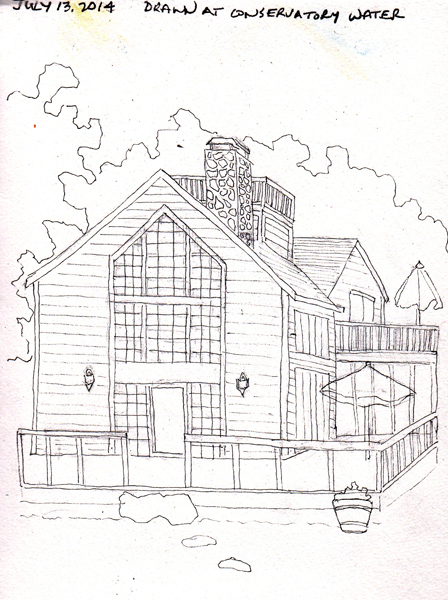 The first is a line drawing of the home we visited on Martha's Vineyard last month (from photo). I still haven't decided whether I will paint this. It started to rain, but we were nicely protected by the big umbrellas on the tables on the Snack Shop Patio. We invited someone without an umbrella to join us in our extra seat and she stayed and talked for awhile after the rain shower ended. 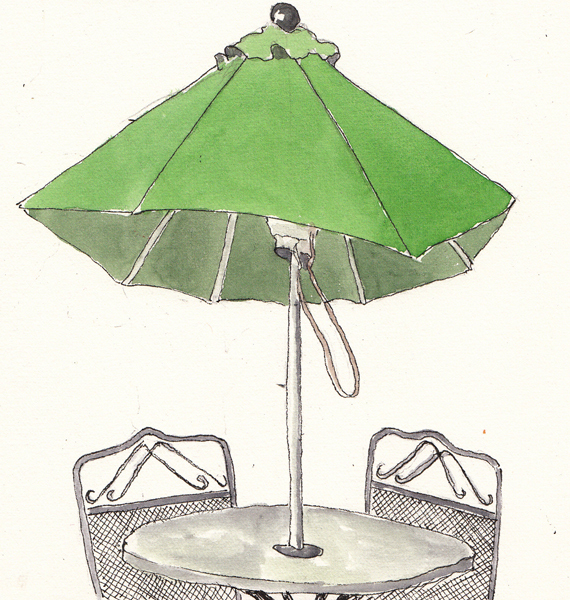 Meanwhile I sketched a partially opened umbrella at an adjacent table. 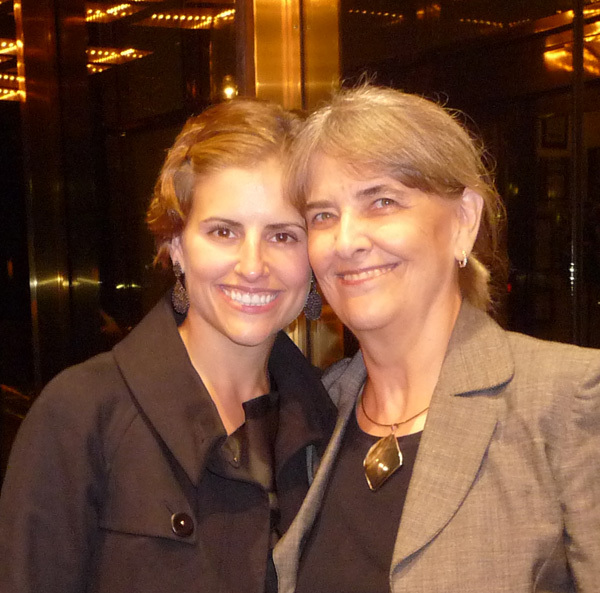 She arrived Saturday night from London and was here to work on a West End play that is moving to New York City. 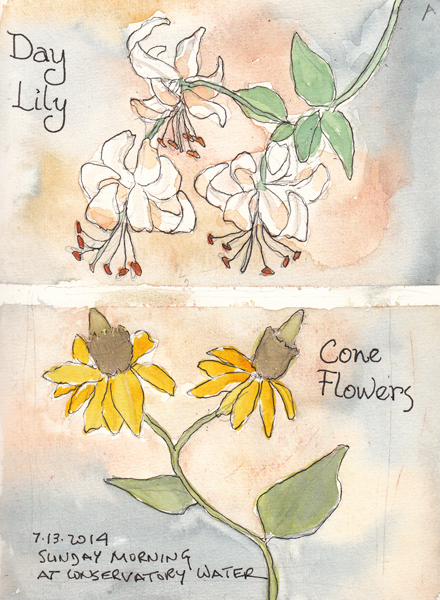 When the sun came out, I sketched two of the many types of flowers that are in bloom around the patio.